Zach Skow was dying of liver disease when he was 28 years old. He had delusions of other kinds back then, but not about his own mortality. He had abused his body with alcohol and drugs since he was a teenager; he existed in a haze of using, selling, and lying his way to his next retreat with the substances that were stealing his life. The raw reality of end stage liver disease meant his organs were losing function; time was against him much like the voice that had raged in his head since his downward spiral began. The war of angry words in Zach’s consciousness mocked him with incessant reminders of worthlessness and fear. This emotional turmoil held him hostage when interacting with others; drinking and drugs masqueraded as the anecdote offering false courage. The spell of his addiction meant Zach drove and worked drunk; no space was safe from his destructive pattern. Zach fantasized about ways to end his existence, but perhaps a purpose yet to be realized blocked his ability to ever enact this desire. When he was admitted to Bakersfield Memorial hospital, he was given 90 days to live without a liver transplant and would have to remain sober for six months to receive it. Zach’s organs continued to shut down, he was swollen with a yellow hue to his eyes and body. He was poked, prodded and withstood the intensity of various medical procedures. Barely existing within the walls of this environment, Zach’s father took matters into his own hands. He broke his son out of this hospital and found a way to transition him to Cedar Sinai as a comprehensive transplant patient. Several weeks into this medical odyssey, Cedar Sinai released Zach to the Tehachipi, CA, home of his father so he could essentially prove his sobriety and fitness for the potential transplant. The odds of Zach being ready for a clean, healthy liver in four months were slim. His dark night of the soul continued. His will to live waned. Arriving to the mountains with his dad, Zach was a shadow of his former self; 140 lbs. of atrophied muscle, bruises, scars, blisters on his feet- all signs that tauntingly announced his recovery was still in doubt. A seizure-filled, painful withdrawal from opiates, administered to him in the hospital, resulted in trips to the emergency room. If Zach had figuratively looked up, he would have seen rock bottom; and yet the intimacy and bonding with his sole caretaker, his father, escalated to new heights. Weakened, and broken, one fate-filled day, Zach looked at himself in the mirror, where the agony of his current life reflected at him through hollowed eyes. Soul crushing experiences had challenged his dignity, and the dam of emotion broke as tears washed his soul for a new day. He noticed some other beings in the frame of that mirror. His rescue dogs, Tug, Marley, and Buddy wagged their tails expectantly and vigilantly in unison. These trusting dogs only held love for the man they saw as king and leader of their pack. Zach had led the large dog foster program at the Humane Society years before, fanning the embers of his advocacy for the toughest, and hardest to place dogs. He felt a kinship to the animals deemed less desirable by society; creatures whose emotional scars were planted so often by no fault of their own. Zach’s dogs became his teachers and his inspiration. He summoned the strength to begin daily walks and write in his journal. His pups didn’t let him wallow or stagnate in the house; their needs became the vision Zach would need to see his way out of his darkness. The animals could have cared less about his past failings, or current condition. He was their world. Despite infection and physical draw backs, walking the dogs became a vital motivational practice that led to road trips, and visits to parks and playgrounds. The haven for Zach’s most profound healing shifted from his environment to his mind- with this transformation, he dared to dream again. Zach’s conscious recovery process included making a radical change in his diet, it became low salt, and flush with vitality-infused smoothies; he ate lots of vegetables, fruits and chicken. Accountability stirred with his commitment to AA meetings; as he became cleaner and clearer. Serendipitously, in August of 2016, on the anniversary of the day he was first admitted into the hospital with his fatal disease, a fibrosis scan revealed his liver was no longer cirrhotic. Restoring normal liver function was a banner of the miraculous conspiring to give Zach a greater voice. This inclusion in a 1% of people in his original condition, revitalizing a dying liver, was recently confirmed by another scan. Back surgery in 2015 was a feat that has left a challenging impact on most everything he endeavors to do, but he is centered, grounded and works with this condition in a positive way. He wears his vulnerability like a second skin. He relates to the struggles of others while using his message and painful memories to enhance lives. Gratitude fuels his day’s connections and interactions. Destiny called once more in the most unexpected way. Zach never thought he would marry or have his own family, but when he met Heather, he fell in love immediately. No stranger to the dog rescue community, Heather, a beautiful, compassionate woman, has made a home with Zach, adding her own magical touch to the rehabilitation and fostering of many of the neediest yet deserving dogs that have passed over the threshold of Marley’s Mutts. Only one thing could more powerfully shadow the darkness of Zach’s prior fear, despair, and pain. Light. It came in its purest form with the birth of their baby, girl, Shiloh Rain in April, 2018. It took him many years to discover, he was born to nurture. Zach now feels like a passenger in a greater life plan; he is thankful for his dream team of supportive friends, family, and spiritual guidance that is woven into the fabric of his being. Ginger and Shadow are 2017 Hero Dog Award Nominee! Voting for the 2018 American Humane Hero Dog Awards, presented by the Lois Pope LIFE Foundation, will open February 28th at 12 p.m. PST! Noel loves the same things as any other dog: napping on the couch, romping with other dogs and jumping into bed to spoon with her favorite humans. What makes Noel different is that she has no front legs — not that she seems to notice much. In late November, Noel was brought to a California animal shelter by someone who’d found the badly injured young dog, who appeared to have been hit by a car. 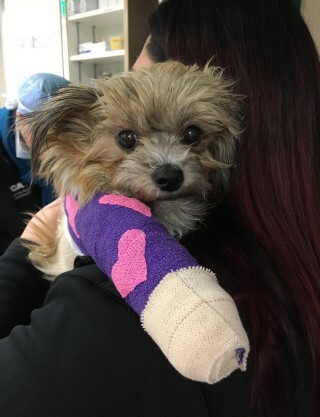 “She was brought to us by a good Samaritan — injured with two broken front legs,” said Nicholas Cullen, director of Kern County Animal Services in Bakersfield. The shelter’s veterinarians tried splinting Noel’s legs at first. “But upon a recheck one of the breaks had become infected and needed amputation,” Cullen said. Not long ago, animals coming into this shelter didn’t stand much of a chance of making it out alive. Pets needing significant medical care would have faced even tougher odds. Cullen said things have changed a lot over the last half-decade, when the shelter went from euthanizing approximately 70 percent of its animals to saving 70 percent of them. Still, while shelter staff did their best for Noel — one of the supervisors even took the pup to stay at her home for a time — a private rescue group would have more resources to devote to the hurt little dog. Marley’s Mutts stepped in to help about a month ago. Two days after Skow brought Noel into Marley’s Mutts, he was faced with a tough decision. Despite initial hopes that Noel’s other front leg could be saved, her veterinarians now advised that either she needed another amputation or would have to be euthanized. Even though Skow had reservations about leaving a dog with only two legs, Noel seemed to want to live. It quickly became clear that amputation had been the right decision, Skow said. “Noel has amazed me with her approach towards life. She is moving right along — no pity, no hesitation, no regrets. She has a disability but it’s not going to prevent her from being happy. We can all take a page from her little book,” Skow wrote on Instagram. “She hasn’t just adapted. She is thriving,” Skow told TODAY. Noel is healthy and well now. Walking on her two hind legs isn’t the most comfortable way to get around, though, so she’s got a custom wheelchair on the way. She’s also had an adoption application put in by one of Skow’s neighbors — if he can bear to give her up, they’ll have “joint custody,” he explained. Skow knows this because he’s been through some tough times himself. He is a former alcoholic and drug addict who credits dogs with having helped save his life a decade ago. He finds comfort and inspiration in Noel now, too, and he knows others will feel the same. A national animal rescue organization recently announced it will feature a local man in its 2018 The Tails of RescueMen USA charity calendar. Tehachapi native Zach Skow was one of 13 inspirational men to be featured in the calendar for their efforts to support the #AdoptNeverShop for a companion animal campaign. 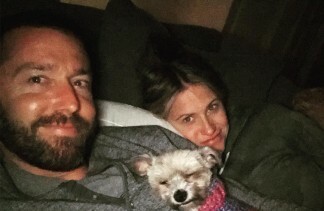 Greenfield is the president of Grandpa Dave’s Creature Comforts and co-founder of the RescueMen USA campaign along with casting director Jen Halpern, president of Pillows for Paws. She said when she and Halpern started on their endeavor, they focused only on New York residents; however, the calendar grew to include the nation by the second printing. After doing a little research on Skow, Greenfield said they very much wanted him to represent their rescue efforts by featuring him in the 2018 calendar. Initially, Greenfield said, she and Halpern wanted to feature your average, next-door man who loves his dog in their calendar. However, this year, the focus has turned to fully-invested rescue men. In 2008, Skow said his own rescue dogs saved his life while he was suffering from end-stage liver disease due to years of drinking and drug abuse. The love he received from his pets turned his thoughts away from suicide and focused him instead on healing. 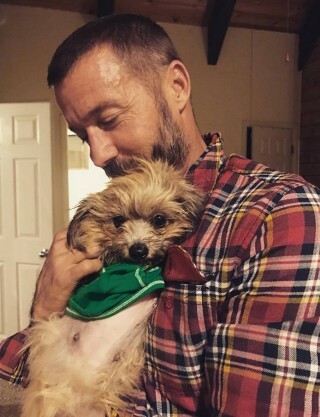 After making a comeback recovery, Skow gained a new purpose in life by founding a rescue that rehabilitates and re-homes thousands of abused and special-needs dogs from high-kill shelters in Kern County. The 2018 calendar will feature a photo of Skow with Hooch, a rescue dog that suffered severe abuse and later was named the 2016 American Humane Hero Dog after being certified as a therapy dog who taught addicts, the homeless and others how to forgive and start anew. The RescueMen campaign’s mission is to spread the word that adoption is the only option when bringing a companion animal into your family. Skow said Marley’s Mutts continues to expand and now operates in four state prisons in California, where 36 dogs are living with inmates. “We have Miracle Mutts educational group that is education at AD schools and institutions in the Kern County area, and we are going to surpass 1,600 spay and neuters for our low-income folks in our county for this year,” Skow said. Marley Mutts adopts out on average of 100 dogs a month. 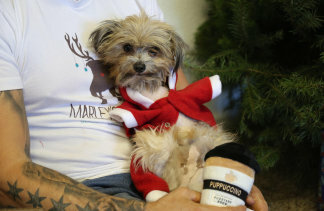 For more information on Marley’s Mutts and the services it provides, visit marleysmutts.org. For information on RescueMen or to order a calendar in support of the #AdoptNeverShop campaign, visit rescuemen.org. Thanks to the love and support of amazing friends like you, Marley’s Mutts continues to rescue, foster, protect, care for, and rehabilitate so many helpless dogs. We have so many programs doing great work right now. We saw a 100% graduation rate from both all dogs and inmates in our Pawsitive Change Program. Mutt Movers is getting dogs into safe shelters and homes up and down the west coast. Our Foster Program has adopted out well over 30 dogs in the past month alone. And we know there is so much more good we can do in the future! This coming Tuesday we are encouraging all of our friends to honor the occasion of Giving Tuesday by sharing their adoption stories. Rescues are our life’s work and we want to know WHY you chose your beloved dog. Additionally, we will be kicking off a massive fundraising campaign to support our programs. On average, it costs Marley’s Mutts around $500 per dog in our care. This Giving Tuesday, we are attempting to raise $50,000 in an attempt to save 100 dogs. The goal is lofty but we have a great opportunity in front of us with both Facebook and Crowdrise matching funds for donations and waiving all fees. With the continued support of friends like yourself, we believe that we can save well more than 100 dogs this Tuesday. So keep an eye on our social media for your opportunity to give this coming Tuesday. In honor of #GivingTuesday, Facebook and the Bill & Melinda Gates Foundation will be matching up to $2 million of funds raised on Facebook for US nonprofits. Donations made through Facebook’s charitable giving tools can be matched up to $50K per nonprofit or max of $1K per fundraiser or donate button, until the $2 million in matching funds run out. The match will begin at 8AM EST (5AM PST). Don’t miss out on this incredible fundraising opportunity to double your donations!